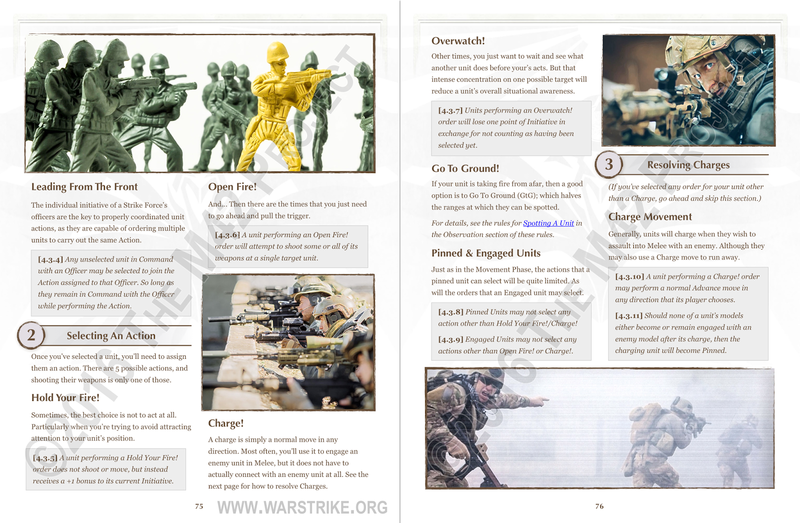 Here's the next two pages of the Melee Phase. 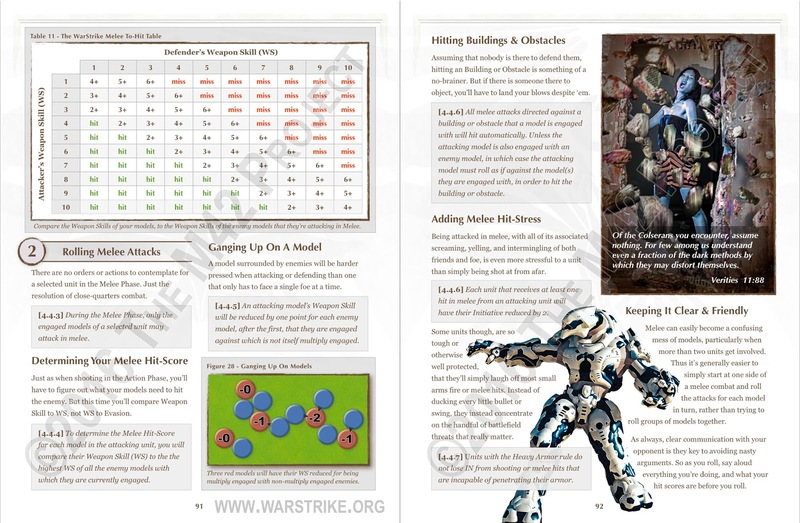 Some of the rules have been edited some more, but mostly it's just the remainder of my previously-finished melee bits spaced out a little more. The thing about wrapping up the last turn phase in a game where you've already written 3 tightly-bound phases (and a couple of intro chapters) already, is that every little change you make to the final one has to be checked and propagated against the first three. Or more simply put... I keep having to edit stuff in 3-5 other chapters every time I work something out in the Melee Phase. Usually because I want to avoid having 2 only slightly different versions of the same rule in different places. Had to make some changes to the last couple of pages I posted on the Melee Phase, as I realized that I'd missed explaining a couple of things. If you ever wonder why I use a lot of large illustrations throughout the book, this is one reason. 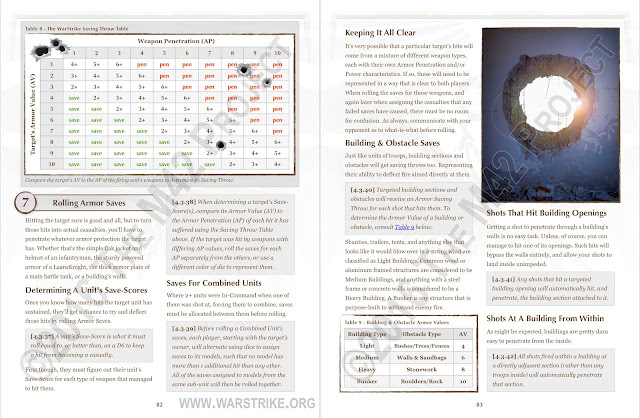 So I can add new information without having to mess up the layouts of the pages that come after. Here's the next section in the tweaked Action Phase. 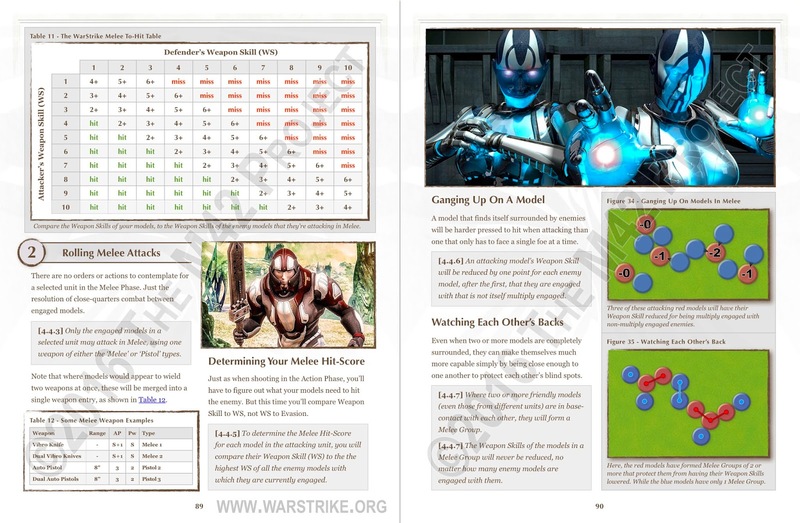 I'm kind of proud of the fact that I was able to condense and simplify 4 pages of armor save rules, and some overly complex examples, into just 2 pages that read very simply. Which means that the total page count for the section remains unchanged. Even though I added a couple of pages of rules on resolving charges. The corresponding Melee section will be next. Here at last is the next two pages in the Melee Phase. In working on this and the Action Phase in tandem, I've been able to avoid re-writing the same rules in a melee context (makes the section shorter), while I make sure that earlier rules that also apply to the melee section explicitly say so. 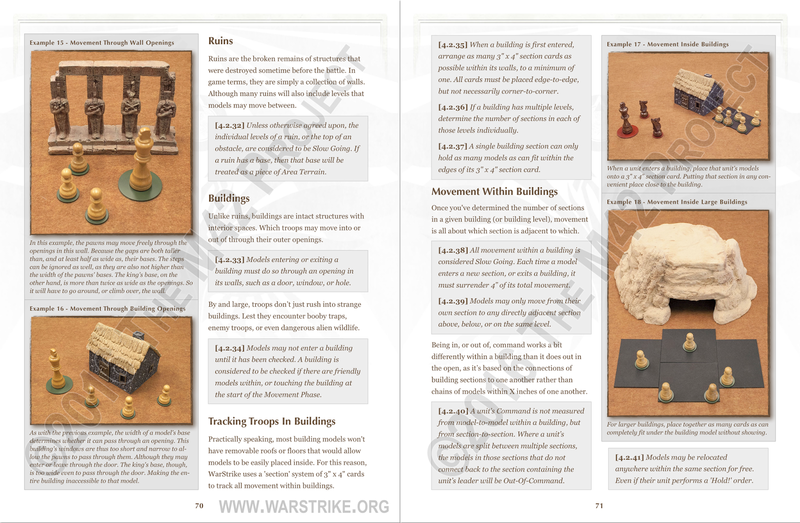 You may notice the "ganging up" rules for melee, which were inspired by a commenter here on the blog. 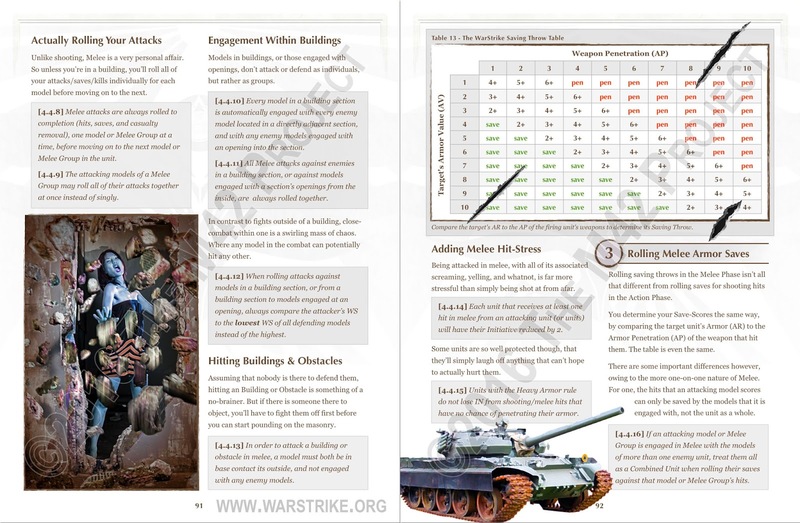 While the Heavy Armor rules that I had added to the Action Phase (after the last post) were then moved over to here to avoid a rules precedence issue (later numbered rules always take precedence over earlier numbered ones). Since rule [4.4.6] could have been interpreted as overriding Heavy Armor if the latter didn't appear after it. Here's the next two pages of the Action Phase. 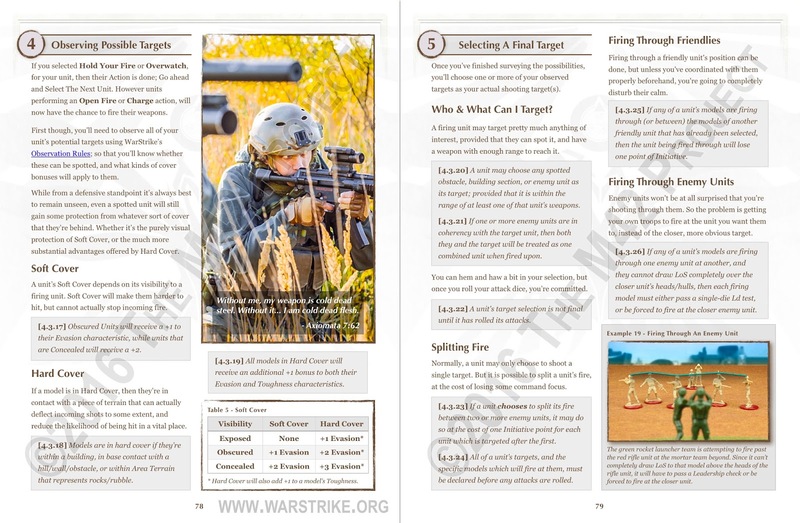 Notable changes are the rule which clarifies that each model can only fire one weapon, and the changes to Hit-Stress that clarifies that units will only lose initiative from a salvo if actually hit, and that units that split their fire cannot cause Hit-Stress. While I added another rule, "Heavy Armor", for units that don't care about small arms fire (like tanks). They'll only take Hit-Stress if something hits them that can penetrate their armor. Here's the next two pages, which cover the final two sub-sections before we get to rolling attacks. Since this is where the Melee Phase is at the moment, you'll see more parallel Action/Melee Phase posts coming up. One page of additional Wall, Obstacle, and Building rules for Charging. You'll have seen some of this before, but then I realized that I needed to work out the rules for Charging into/within buildings. 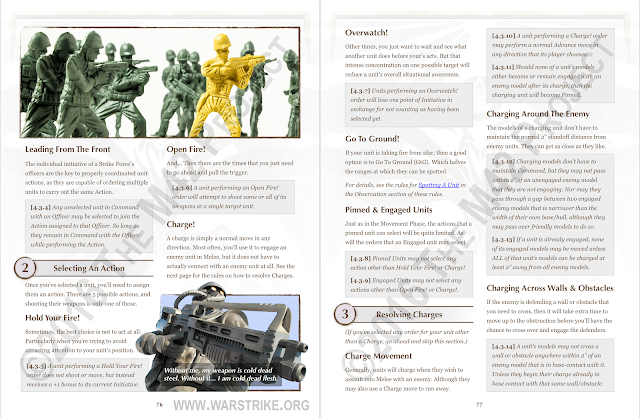 So these pages got some new illustrations, and the charging rules will be finished up on the next page. A few wording tweaks here and there, in addition to the graphics optimizations, but nothing much else of note. 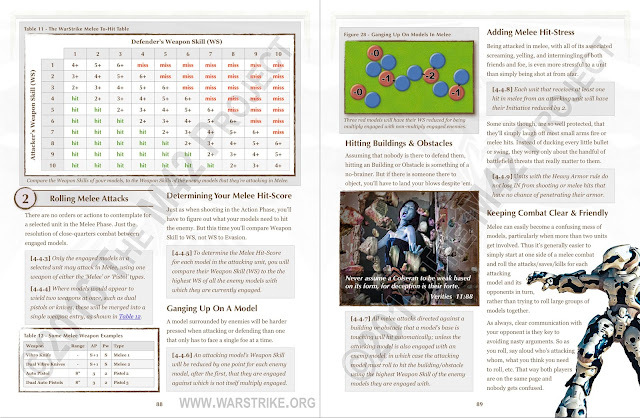 Except that I'll be moving on to the Action & Melee sections next, which will have a lot more new stuff going on. Today was mostly, apart from our fiber being installed (yay! ), a boring morass of nuts & bolts crap like switching domain providers and looking for some good forum software to use in the future. But I did get these two pages updated from the Movement Phase to current layout/image standards. 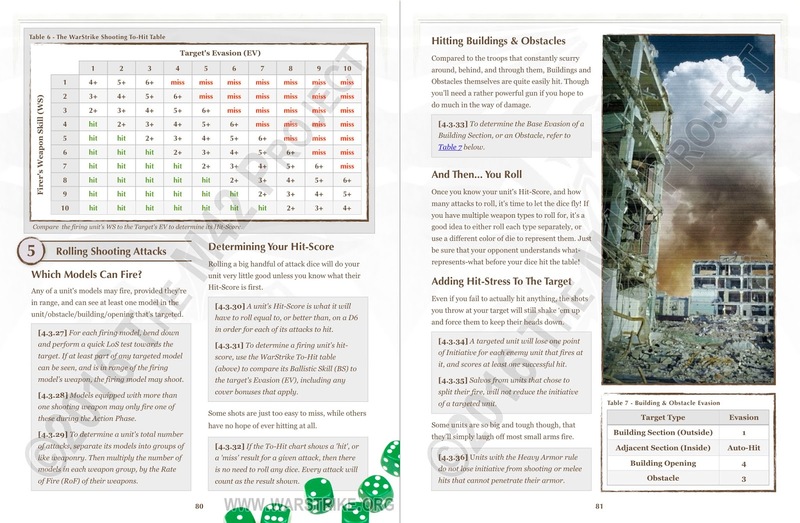 Actual rules changes are minimal apart from the renumbering that was required due to earlier changes in the section. Here's another update to the Action Phase section. With the separation of Charging from the Melee Phase, I needed to re-work the available orders a bit, and then define what you can do during a charge move. 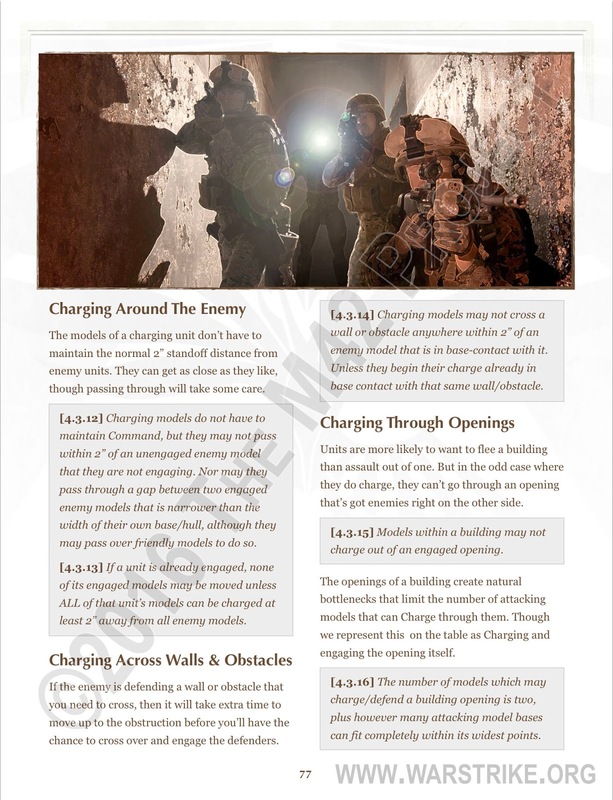 I'm glad to say that I successfully boiled down 3 pages of detailed charging rules to the bit more than half a page that you see here. While each rule is quite simple, their interactions are quite interesting. 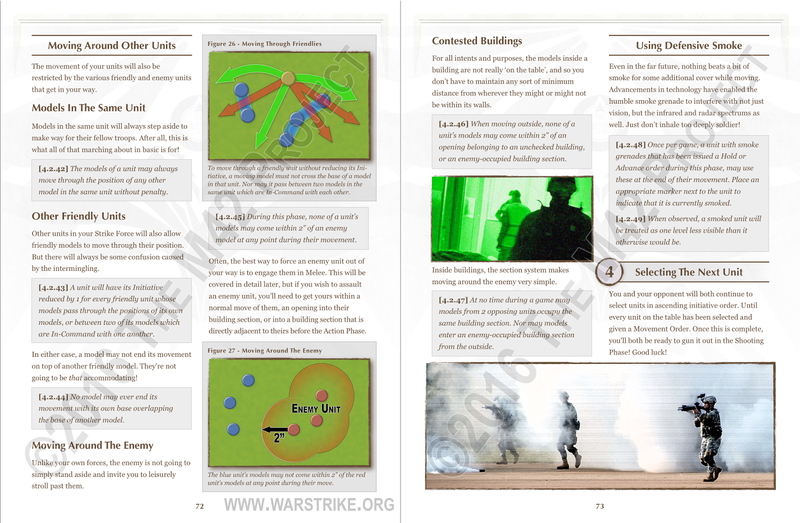 Here's 3 pages from the Movement section of the rules. The first two, pages 67 and 68, are pretty much the same, as all I did was optimize the graphics to have exactly as many pixels as needed for display on a retina iPad or iPad Air. For the third though, I re-worked the illustration quite a bit and added some flavor text. I was in the local camera shop today, looking for a particular kind of fill light, when I struck up a conversation with one of the salesmen. Once I mentioned that I'd given up using my Nikon D50 DSLR in favor of an iPhone 6s (with the 645 Pro app) for studio shots, he was aghast. Maybe... MAYBE... A 6s could do better than the relatively ancient D50, but there was NO WAY that the image quality of an iPhone could compare to a modern DSLR! ESPECIALLY in low-light situations! He pointed to the counter, where they had a nifty little graphic that showed the relative sensor sizes of phones versus those of DLSRs. "I flat-out don't believe you." 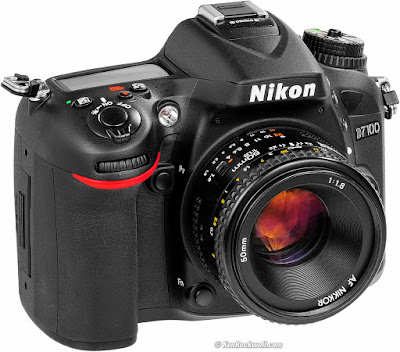 he told me, when I described the comparisons I'd seen on the web using $1500 Nikons. Well... Ok, let's put this to the test then.